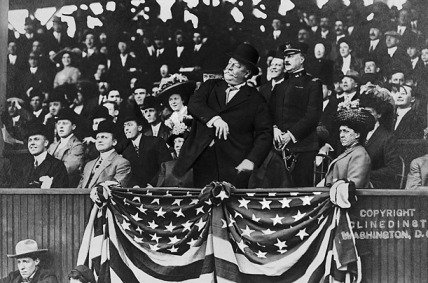 William H. Taft becomes the first president to throw out a ceremonial first pitch on Opening Day. This afternoon, President Barrack Obama extended a 100-year presidential tradition by throwing out a ceremonial first pitch on Opening Day. Dressed in a Nationals jacket and White Sox cap, the left-handed President Obama stepped atop the mound and lobbed a soft toss that would have been high and outside to a right-handed batter (see video after the jump). After delegating the honor to Vice President Biden last year, President Obama picked up a presidential baton that dates back to the administration of William Taft. President Taft needn’t have worried. Although the Senators would finish in the second division again, Johnson, who was just starting to embark on perhaps the greatest pitching career in the history of the game, would go on to have a stellar season. Baseball wasn’t a novelty to William Taft. He was an avid fan of the game and attended many during his presidency (14 in total). He also became the first President to attend a game outside of Washington, attending games in Pittsburgh and later Chicago during the 1909 season. President Taft was such a baseball fan that after leaving office, he was strongly pursued to fill the office of a one-man baseball commissioner after the 1918 season. At the time, baseball was ruled by a three-man tribunal system that had stirred up considerable controversy, not the least of which involved player-owner relations. Who knows, had President Taft taken the consolidated position as sole baseball executive, perhaps the Black Sox scandal could have been averted? In many regards, President Taft’s first pitch put the presidential seal of approval on baseball’s status as the American pastime. Even though baseball teams had been invited to the White House as far back as the Andrew Johnson administration, and Benjamin Harrison had become the first president to attend a game back in 1892, Washington Senators’ owner Clark Griffith had actively sought the presidential stamp for years before Taft. Grover Cleveland famously turned down a first pitch invite out of fear of being portrayed as a slacker, while William McKinley accepted an invitation, but simply never bothered to show up. After Taft’s historic first pitch, however, a tradition was born. Woodrow Wilson, himself an avid baseball fan, immediately continued the tradition (and extended it to the World Series when he tossed out the first pitch in 1915), and since then nearly every sitting President has undertaken the honor. In fact, only Jimmy Carter (an ironic omission, as Carter was a big baseball fan who was frequently seen at Braves games after he left office) has failed to throw out at least one pitch at an Opening Day, All Star Game or World Series game. Let that be a lesson to all future executives who hope for a second term! While some Presidents have embraced the Opening Day first pitch more than others, the tradition has endured throughout baseball’s changing eras, including a period when there was no major league baseball in Washington D.C. Unfortunately for today’s Nationals fans, the hometown team has also kept up their end of another long tradition by ensuring that Washington remains first in war, first in peace and last in the National League East. Since 1910, every President except Jimmy Carter has thrown out a ceremonial first pitch on Opening Day. Great post, well done William! Will be checking in here daily, promise no Limbaugh baiting..
Shame that the Nationals are so awful, when I was in the DC area I felt there was such a passion for baseball, and that the Orioles were never really accepted as “theirs”..let’s hope Strasberg is the real deal. It would be nice to see the Nats improve, but they still have a ways to go. I wonder if there are any plans to have McNabb throw out a first pitch? I’ll bet he throws one before Strasburg…McNabb is already arbitration eligible! Don’t follow football much anymore..but isn’t McNabb a top-10 QB? Why would they trade him? Can’t WAIT to watch Strasburg vs. Hayward..new generation of All-Stars! BTW, in your “trading places” box upper right, typo on Matsui-san..it’s “Hideki”, no “c” needed! Lastly..do you think they booed Nixon when he threw out the first pitch? Was he scowling? Bill James has a great photo of Nixon in 1960 with a very old looking Ty Cobb..there’s a nice pair for you! Thanks for the correction…the World Series MVP is barely gone and I already forget how to spell his name. As for Nixon, once Watergate hit the fan, he started to lay low, so my guess he is received polite applause during his ceremonial first pitches. Also, his second first pitch in 1973 took place in Anaheim Stadium (the first such pitch outside of DC), so being on home turf probably helped.